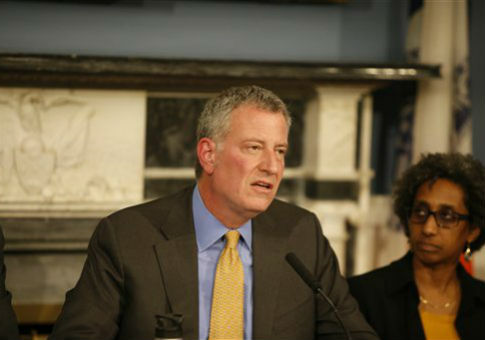 Bill de Blasio, New York City’s Democratic mayor, is being accused of violating conflict of interest laws by wading into the negotiations between Hillary Clinton and Sen. Bernie Sanders (I., Vt.) over a proposed presidential debate in New York. The Foundation for Accountability and Civic Trust, an ethics watchdog group, says that de Blasio strong-armed Sanders into agreeing to debate on Clinton’s terms by baiting the Vermont senator with permits for a rally in the city later this month. The group argues that de Blasio’s actions advanced the interests of Clinton, whom the mayor endorsed last October. The Clinton and Sanders campaigns have sparred over scheduling a debate in New York ahead of the primary there later this month. The Clinton campaign proposed a debate in Brooklyn on April 14, a date Sanders initially resisted because he had planned a rally that evening in New York City for which he had already obtained park permits. "Let’s make ‪@NY1 4/14 BKLYN debate happen," de Blasio wrote on Twitter Monday morning. "‪@BernieSanders: I’ll help you secure any permit you need to ensure your NYC rally can happen too." Later that day, Clinton and Sanders agreed to debate on April 14 in Brooklyn, home to Clinton’s campaign headquarters. Matthew Whitaker, a former U.S. attorney who serves as executive director for FACT, told the Free Beacon that de Blasio improperly used his city position to push Sanders to agree to a debate on Clinton’s terms. "It is not only unethical, but an apparent violation of conflict of interest laws for New York City Mayor Bill de Blasio to use the Office of the Mayor to advance the interests of his preferred candidate in the Democratic presidential primary race. Using the Mayor’s office in this manner is a misuse of City resources and implies City endorsement of partisan politics," Whitaker stated. "Moreover, it is unethical and outrageous that Mayor de Blasio would use the City function of issuing or not-issuing a permit to strong-arm a political candidate." The watchdog demanded that de Blasio "immediately clarify for the citizens of New York that he is not using the resources of City Hall to traffic in political favors and will never do so." While permitted to participate in most political activities, New York City employees are required to follow certain guidelines. According to a plain language guide of restrictions provided by the city’s Conflicts of Interest Board, public employees are barred from using their official positions or resources to help a political candidate or campaign. "Public servants may never use their City positions or any City resources to help a political candidate or a political campaign," the guide said, defining such an action as the "misuse" of a position or resources. City employees found guilty of violating conflict of interest restrictions could face "severe penalties," including demotion, suspension, and even termination. The Conflicts of Interest Board can also impose a fine of as much as $25,000 on individuals for each violation. "A violation of the Conflicts of Interest Law is also a misdemeanor that the District Attorney’s Office may prosecute. Upon such a conviction, a violator could be fined, sent to jail and lose his/her City job. The Conflicts of Interest Board may also void any contract or transaction that violates the Conflicts of Interest Law," the board writes in the guide. A spokesperson for de Blasio’s office told the Free Beacon that the city has offered to help any presidential candidate, regardless of their party affiliation. "The City has offered to help any presidential candidate identify a public space appropriate to discuss their policy positions and candidacy. Republican or Democrat alike," spokeswoman Karen Hinton said. De Blasio endorsed Clinton last October, applauding her "sharp progressive platform" during a television appearance. The mayor indicated he would be willing to campaign for Clinton. De Blasio’s ties to Clinton go years back, and he served as the campaign manager for her successful 2000 senatorial bid in New York. After Clinton and Sanders agreed to debate on April 14, Sanders campaign spokesman Michael Briggs said that the Vermont senator’s rally had been rescheduled to "accommodate Secretary Clinton’s jam-packed, high-dollar, coast-to-coast schedule of fundraisers all over the country." Local publication DNAInfo.com reported that the Sanders rally will take place on April 13 in Washington Square Park. The city Parks Department is reportedly working with the campaign to process its application for permits submitted last week. Such an application usually takes 21 days to be processed. "We had thought the Sanders campaign would have accepted our offer for a Brooklyn debate on April 14 in a New York minute, but it ended up taking a few extra days for them to agree," Clinton campaign spokesman Brian Fallon said in a statement Monday. "We are glad they did." The debate, to be hosted by CNN and Time Warner Cable News NY1, will take place five days before the New York primary. While Clinton has an 11-point lead over her competitor among likely Democratic primary voters in the state, according to a Real Clear Politics average of polls, recent surveys have showed Sanders closing in on the former secretary of state. This entry was posted in Politics and tagged Bernie Sanders, Bill de Blasio, Hillary Clinton. Bookmark the permalink.